PETALING JAYA: Demand for luxury residential properties is expected to turn cautious, given greater economic uncertainties and a tightening of credit by banks, DTZ Research said in its latest Property Times market report. In the report for Kuala Lumpur for the third quarter, the research house said there would be an increasing downside risk on prices at the higher end of the market if the conditions got worse next year. “The residential sector experienced significant completions in the quarter and this will put pressure on rentals, especially in the larger prime condominium units where demand has not kept pace. “Generally, while price remains stable, new pressure to sell is expected as some owners taking delivery of completed units may wish to exit their investments. There remained selective demand for new launches,” it added. The quarter saw the completion of a significant number of projects with an additional 2,278 condominium units in Kuala Lumpur, including two city-centre projects: Brunsfield Embassyview and The Pearl, eight projects in Mon’t Kiara, and one in Bangsar. A further 52 condominium units are expected to be completed by the end of the year, all of which are in the city centre. In 2012, about 5,384 units are expected to enter the market with about 92% or 4,952 units located in the city centre. A boutique luxury condominium project in Persiaran Raja Chulan, St John Woods Residence, has reportedly received strong response, with almost half of the 48 units booked within two days. The selling price of the units are between RM3.3mil and RM4.4mil each (or RM900 per sq ft). 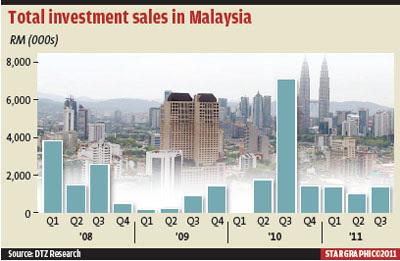 According to Property Times, the average capital value of high-end condominiums in Kuala Lumpur is generally stable at RM626 per sq ft, with properties in the Kuala Lumpur city centre averaging RM902 per sq ft.
“The market may see short-term selling pressure as owners of newly delivered units may exit their investment,” it pointed out. The average rental value of high-end condominiums in Kuala Lumpur is stable at RM3.50 per sq ft per month but new completions will keep the rate competitive, especially for larger units where demand has not kept pace with supply. It noted that to maintain or increase pricing level, developers had resorted to smaller units marketed under the guise of small-office home-office in mixed developments to appeal to younger buyers seeking more lifestyle options and to investors. The outlook for the office sector is likely to be more sombre in the light of substantial pipeline supply in 2012. Three office buildings are expected to be ready by the fourth quarter this year, which will add 1.1 million sq ft to the year’s total supply of about 2.5 million sq ft. They are D’tiara Amanaraya Corp Tower, Crest Tower and Lot E @ KL Sentral, of which the first and third properties will be substantially owner-occupied. The report pointed out that external headwinds were expected to create uncertainties and the overall net absorption rate could further slow in the fourth quarter, adding that the situation would not provide comfort to a market that was expecting 2012 to be a potential tipping point with some 7.4 million sq ft projected for completion in the office market. During the third quarter this year, leasing activities were driven mainly by the oil and gas, information technology (IT) and financial sectors. With no new completions adding to competitive pressure, office rents remained stable with prime gross rental rates at RM6.22 per sq ft a month. Among the major leases and relocations were that of RHB Insurance at The Icon for 100,000 sq ft and Touch n Go taking up 67,000 sq ft at The Horizon, Block 6, Bangsar South. The third quarter saw no change in the capital value of office buildings, with good quality suburban offices sold at RM600 to RM700 per sq ft. The average capital value of prime office in Kuala Lumpur stood at RM807 per sq ft. The investment property market saw an increase in both value and activities, with total value topping RM1.3bil in the third quarter, an increase of 39% from the second quarter. There were 10 deals in the quarter – five offices, two mixed developments, and a retail, industrial and residential property each – compared with eight in the second quarter. The biggest deal recorded in the third quarter was the sale via public auction of The Putra Place, which was sold to Sunway REIT for RM513.9mil. The other major transaction was a prime office building in Cyberjaya – Bangunan Lestari Kumpulan Emkay – that was on a long-term lease to Shell, with an estimated initial yield of 5.7%. Most of the properties sold are located in and around Kuala Lumpur, with one transaction recorded in Penang, a Tesco-leased hypermarket in Tanjung Sri Pinang, and in Johor Baru where a major prime stratified office, Menara Landmark, was sold via a public auction to developer Daiman Bhd. The investment market was more active with strong deal flows from investors and also supported by end-users buying for own occupation. But going forward, the market is expected to be dominated by local investors as foreign investors have become more cautious. In terms of pricing, Menara Landmark was sold at RM164 per sq ft, which the report noted was significantly below the RM600 to RM700 per sq ft fetched by good quality suburban offices in Kuala Lumpur. Three of the transactions during the quarter involved mid-sized offices purchased for owner-occupation. The buyers are from the IT, oil and gas, and infrastructure sectors which are key sectors under the Economic Transformation Programme. As for the retail sector, Property Times said rental growth was likely to be moderate going forward, especially with new malls still sprouting up in the suburbs in an increasingly tougher operating environment. About 860,000 sq ft of new space was added in the quarter in Kuala Lumpur with the completion of three major retail centres – Suria KLCC (extension), Solaris 2 and 1 Shamelin Shopping Mall. The total stock reached 45.8 million sq ft in the Klang Valley. It said the overall outlook for the retail sector was expected to remain optimistic due to a stronger ringgit, with total retail sales projected to grow from RM182.44bil in 2011 to RM279.83bil by 2015. The average occupancy rate at retail centres registered a slight increase to 91% in Kuala Lumpur and 88% outside the capital. However, newly completed retail centres have experienced slow leasing rate, given the increasing market saturation of retail facilities even in good suburban locations. Meanwhile, growth in online shopping poses a challenge to the domestic retail industry which is facing higher costs of goods and operations. In 2010, there were about 1.1 million online shoppers with an average RM2,500 spending per head. According to a research by AC Nielson, the online purchasing market had reached RM1.8bil in 2010 and is expected to increase to RM5bil in 2014. “This rising trend is a challenge to local merchants who will have to adopt multi-channel retail strategy to capture the rising online market,” Property Times added.